East Anglia, and Suffolk in particular, has so many treasures of the Perpendicular period that the little jewels of the earlier Decorated stand out as being of more than usual interest. And there is more to this difference than mere architecture. It seems to have an effect upon the way the buildings are kept. Perpendicular lends itself to neatness and order; there's something about those big windows that makes people want to tidy up and polish the woodwork. Not that Decorated buildings are necessarily untidy, of course, its just that they seem so much less sterile, more organic and in touch with their ancient roots. And perhaps a bit dustier too. 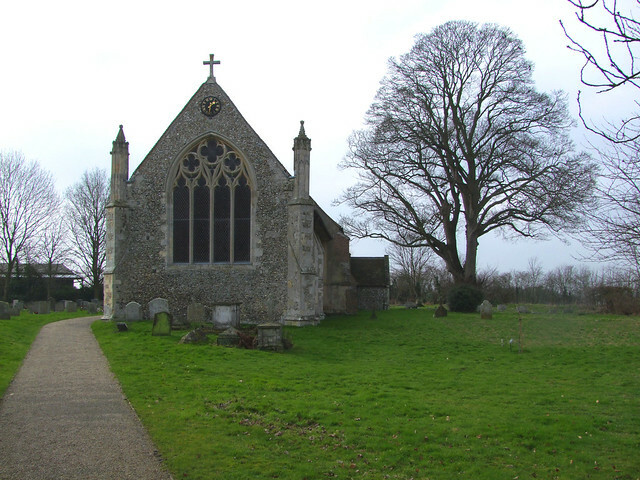 Raydon, like Cotton in mid-Suffolk and the chancel of the nearby Essex church of Lawford, is a perfect example of this. The tower herecollapsed in the 17th century, probably during the Commonwealth, and possibly during the great storm of September 1658, when a couple of other Suffolk steeples came down. It has been replaced by a little bell turret, but apart from this the church is all of an early 13th century piece, its Decorated tracery second only to that at Cotton, I think, in all Suffolk. Like Cotton, Raydon has not been touched up too much. The Victorians reset the glorious piscinas and window stonework in their original places. This is especially important here, for, as the church guide records, a book of hours in the University Library at Cambridge was originally prepared for Alice de Reydon, daughter of the Lord of the manor here in the late 13th and early 14th centuries. The illustrations, incredibly, are set in frames which echo the contemporary tracery in the windows and piscinas here. The outstanding details of the exterior are the carvings in headstops and on pinnacles; dragons, lions and wildmen look down disapprovingly. Stepping through the porch past a fine surviving holy water stoup you step into a church that underwent a particularly sensitive restoration in 1883. This produced the pleasant furnishings and floors, but notably and mercifully did not install any stained glass, so the survivals are all medieval, and the church is enfolded in white light - again, as at Cotton. Everything is pretty, and the window tracery has a delicacy about it that I'd be reluctant to touch, for fear of breaking. The chancel is uncluttered, the whole piece deceptively full of space and light. In the south side of the sanctuary there is a double piscina and window with surviving 14th Century glass in the upper tracery. The simple woodwork of the 1880s adds to the ambience, and there are low side windows on both sides of the chancel. The font is a curiosity. Mortlock thought it might have been part of the 1880s restoration, but it is so out of keeping that I think the church guide is probably right in placing it as contemporary with its 18th century font cover - they look made for each other.